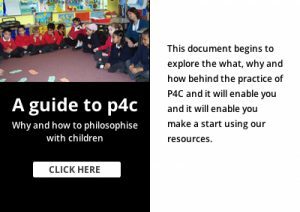 Philosophy for Children (P4C), or some variation of it, is practised in over 60 countries around the world and has a history stretching back over 40 years. The underlying principle is for children and young people to experience rational and reasonable dialogue about things that matter to them and their teachers. All participants work together in a ‘community of enquiry’. The aim for each child is not to win an argument but to become clearer, more accurate, less self-contradictory and more aware of other arguments and values before reaching a conclusion. On this page we offer you two documents to help you understand what Philosophy for Children is, how it has developed and, most importantly, how to do it. If you become a subscriber you will find a lot more advice and many resources. We also provide one-day training to help schools get started doing P4C and using our materials.